S I G N & D I G I T A L G R A P H I C S • April 2018 • 37 Figure 2: Convert the layer to a smart object before apply- ing the filter. Figure 3: Initially the filter is applied uniformly to the entire image. 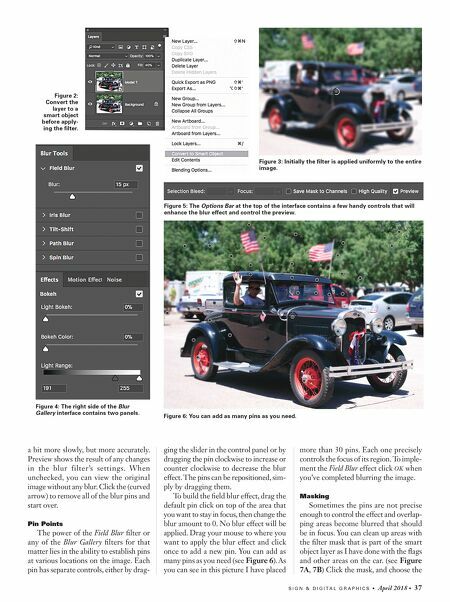 Figure 4: The right side of the Blur Gallery interface contains two panels. Figure 5: The Options Bar at the top of the interface contains a few handy controls that will enhance the blur effect and control the preview. a bit more slowly, but more accurately. Preview shows the result of any changes in the blur filter's settings. When unchecked, you can view the original image without any blur. Click the (curved arrow) to remove all of the blur pins and start over. 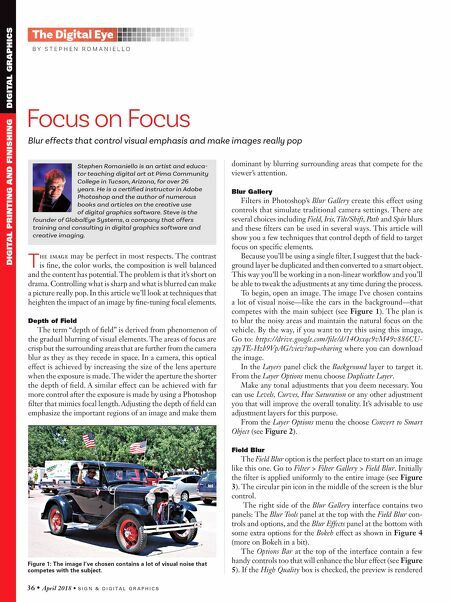 Pin Points The power of the Field Blur filter or any of the Blur Gallery filters for that matter lies in the ability to establish pins at various locations on the image. Each pin has separate controls, either by drag- ging the slider in the control panel or by dragging the pin clockwise to increase or counter clockwise to decrease the blur effect. The pins can be repositioned, sim- ply by dragging them. To build the field blur effect, drag the default pin click on top of the area that you want to stay in focus, then change the blur amount to 0. No blur effect will be applied. Drag your mouse to where you want to apply the blur effect and click once to add a new pin. You can add as many pins as you need (see Figure 6). As you can see in this picture I have placed more than 30 pins. Each one precisely controls the focus of its region. To imple- ment the Field Blur effect click OK when you've completed blurring the image. Masking Sometimes the pins are not precise enough to control the effect and overlap- ping areas become blurred that should be in focus. You can clean up areas with the filter mask that is part of the smart object layer as I have done with the flags and other areas on the car. (see Figure 7A, 7B) Click the mask, and choose the Figure 6: You can add as many pins as you need.